The founders of Colton Teak were a decade ago avid teak shoppers themselves. Unable to find the right blend of high quality, style & value, the driving force behind Colton Teak soon developed. We didn’t believe that great prices had to mean settling for substandard product nor should exemplary quality & construction cost you your first born! Teak should be a wise, pleasurable investment and bring you a lifetime of enjoyment. At Colton Teak, you’ll find a lifelong source for quality, service & value with just a click of your mouse. How do we do it? We start at the source. We manufacture our own lines of Grade A plantation teak furniture in Java, and ship direct to our warehouse facilities in Southern California. No middlemen = lower prices and higher quality control. Our corporate culture fosters a team-oriented environment focused on impeccable service & support. Experience builds dependability. Colton Teak began as, and continues to be, a strong supplier of fine teak garden furniture to several boutique retail establishments in California, where our exacting standards for quality, style & value were honed. 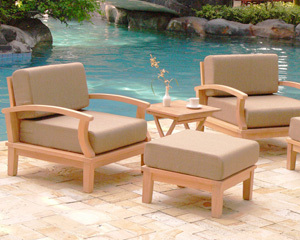 Client driven requests for shipping all over the U.S. and beyond led us to open our doors internationally with a stellar reputation for the highest quality teak furniture at wholesale pricing. Now that’s a marriage made in heaven!